The most exciting footage starts at 1:50. Allmedinger gets a better exit onto the front straight and takes the low line to make a pass. The two cars bang sides twice at 180+ mph. The pass sticks and it eventually decides the race in favor of AJ who hands Michael Shank Racing its first ever Rolex 24 victory. When asked about AJ's tactics after his driving stint, a visibly angered McNish said "It was a fair fight up to that point." One of the best parts about the Rolex 24 is easy access to the garage and even pits during practice. You run into many famous drivers and get to talk to them if you catch them at a good time. Here's some inside scoop heard on Patrick Dempsey's # 71 Aston Martin radio today. Dempsey surprised the team with an unexpected pit-in after a tap in the rear and a spin. The quick driver change put Chris Porritt in the driver's seat with little warning. He goes out for practice laps and the team manager continuously tries to hail the new driver over the radio without success. "Chris! Chris! 1 2 3..."
The 50-th anniversary pace car is very cool! one of the M3 V8s in it before the race weekend is over? The countdown to the Rolex 24 is in full swing. The 50-th anniversary of the historic endurance race has seen unprecedented interest so far. Today we reveal exactly what goes into preparing a Rolex 24 race car straight from one of the most competitive teams in the race: Turner Motorsport. Most of the preparation that goes in between the Roar Before the Rolex 24 and the time the trucks leave for Daytona is focused on making sure the cars’ components will last the entire 24 hours. Fittings and hoses are replaced, driver comforts are tweaked, pedals are adjusted, cooling systems and air ducts inside the cabin are optimized. The team replaces all lexan and installs windshield tear-offs, as spares are very important for the race. Spare nose clips are built and vinylled to match. Electrical system are looked over very carefully, as they can make or break the race, especially at night. (Electrical failures could even be catastrophic.) Setups for wet and dry conditions, as well as cool and hot track are finalized. In-car race videos are fun to watch. There is so much going on when passing a competitor. It takes skills, patience, time and a bit of luck to make the pass stick. The Grassroots Motorsport August 2011 Video of the Month is all about passing and how forcing the issue is sometimes necessary. The footage is from the SCCA Pro Racing World Challenge series. Fastest Way to Learn Italian: Drive Ricardo Patrese's Wife around a Racetrack! Mamma Mia! Tranquillo! Garda! Basta! VOMITO! And to think Riccardo Patrese was only driving a Honda Civic Type R! Imagine his wife's reaction in a Ferrari FXX driven close to its limit: You'd be an expert in Italian in no time! Can Sébastien Loeb Win with This Citroën Rally Car? Apparently, if you pull the e-brake a bit too hard during a rally, a Citroën's rear wheels fall of!! Often imitated, never duplicated: Only a Mazda RX7 is capable of losing all 4 wheels at a time, as demonstrated in this video. Here's some gut-wrenching onboard footage of an open-top Cobra crashing at 130 mph. Open-top cars are very exciting to drive but insanely scary and dangerous if an accident occurs. This Cobra was doing 130 mph on the front straight at Willow Spings when a suspension piece broke. It veered hard right and off track, leaving a 60-foot gash in the asphalt, then continued rolling for another 500 feet off track to its resting point. If the dogs drags their feet, they lock up and just keep sliding along the sand. With an ABS system, they would be forced to take little steps when they start dragging their feet, which allows them to regain traction. Dakar Rally 2012 - The Most Dangerous Race in the World! You might be wondering why the Dakar race is named after a city in Africa but running entirely in South America. Well, it started out as a race from Paris to Senegal's capital Dakar in 1979 and even though it's seen some variation over the years, the route always used to pass through Europe and Africa. This is one of the closest racing actions and for the longest part I've seen in an onboard lap from the Nordschleife. Watch a Mercedes Benz SLS AMG GT3 dice it up with an Audi R8, Porsche 911 GT3s, and another SLS AMG GT3. They pass slower cars like they were standing but it doesn't always work out as planned. Catch the 911 GT3's spin caused by contact with a Mini at 5:20 as it happens right in front of the camera! There's something mesmerizing about driving under the lights. Daytona is not quite as bright as the Formula 1 night race in Singapore but what makes it exciting is that it's not equally as bright everywhere and the illumination changes depending on where you are on the track. The Rolex 24 shakedown kicked off in Daytona this weekend. This is the commemorative 50-th edition of the 24 Hours of Daytona and the stakes are especially high for all teams this year. Turner Motorsport is campaigning 2 cars in class GS and 2 in class GT. The #96 #97 GS and #93 #94 GT cars have been on track today and yesterday and all drivers have had a chance to get behind the wheel. Turner is reporting the cars are running OK. GT cars have been in the top half of the field. Will Turner posted: "Nice sunny day here in Daytona. Cars running OK. Those Porsches sure are fast though!" So you pay a ton of money to go to a track weekend and travel half a day to get there. You go out on your first session, get comfortable with the track, you find the driving line and braking points and you even hit a few tight apexes. You get out of the car after the session and you are all smiles as you start checking the tire pressure. You tell your buddy about how great the car felt and how you're going to go out and refine the line, get more consistent and add more speed on your next session. Even the weather is co-operating and it's shaping up to be a great weekend. Well, don't let the ridiculously annoying "Check Engine" light spoil it! We covered the Check Engine light in this write-up and you probably know by now that all cars sold in the US after 1996 are required to have a diagnostic system to track emissions-related problems. This system is called OBDII (On Board Diagnostics, second generation) and it contains a set of monitored parameters with corresponding fault codes. Regardless of the vehicle you drive, you have probably seen the “Check Engine” or “Service Engine Soon” light displayed on your dashboard at least once after a fault code was triggered. 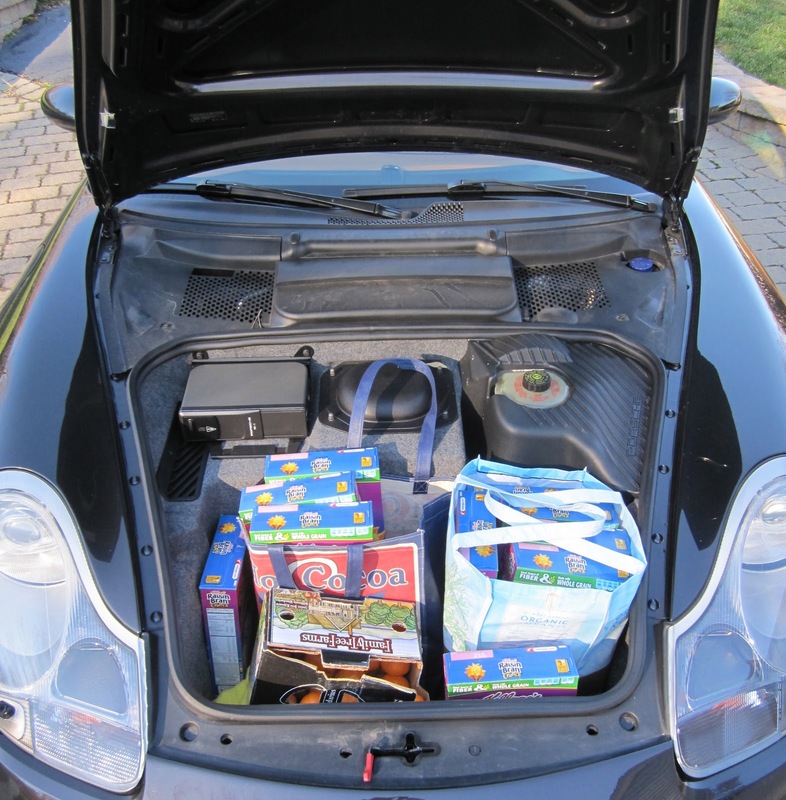 Grocery-Getter Family Caught Cheating Again, This Time with a Porsche 911! 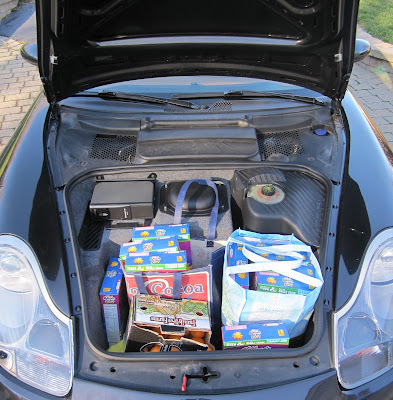 Unlike the past cheating scandal with illegal weight in the trunk, this time the perpetrators are targeting front-end grip with groceries tucked in right under the hood. It's just a fact of track driving: As much as you try to get the right "line" and hit the apex every time, sometimes you're too early or too late. Most often, it's no big deal and a little correction in steering, braking or throttle gets you out of trouble. However, things at the track happen fast and sometimes you can end up way off the driving line. That's when you should remember what your instructor probably told you a hundred times: Don't over-correct! Putting two wheels off the pavement is OK as long as you keep the wheels straight. And if you're going to go completely off track, try to keep the car as straight as possible with both feet in (clutch and brake). Jump to 1:12 in this video where the black BMW 335i enters Turn 2 of Washington State's Pacific Raceways. Turn 2 is a fast sweeper with exit speeds reaching 80mph or so on a hot lap. Continuing on our journey of upcoming season car prep on a shoestring, today we'll talk about an often overlooked setup component: Tire Pressure. Planning on how you will approach your tire choices and pressure-to-be-used is one of your biggie considerations for next season. If it isn’t, it certainly should be. 1. You will gain significant tire pressure throughout the day. 2. Pressure will greatly affect your contact patch and tire adhesion levels. 3. Pressure will greatly affect your under/overseer characteristics. The art of air pressure is to achieve the largest contact patch, while maintaining lateral sidewall stiffness. You want to keep the sidewall from rolling over (dangerous and expensive), while allowing as much of the sticky stuff gripping the road surface. Both increase cornering agility and acceleration.